Comments: GPKtilldeath hooked me up with 40+ black border BNS 2 cards and some GITD's and Foldies. Great dude! Thanks again man! Comments: Good guy to deal with. Had no issues with the sale. Comments: Traded some Chrome refractor's. Card's arrived quickly & in great condition from Finland. Thank you for the trade. Feedback Type: POSITIVE A+ Super awesome! Comments: GPKtilldeath is frigging awesome! Out of the blue he sent me some foreign cards I needed and a couple of other bonus cards as well! What a guy, I owe you one man! Comments: Another great transaction. Really great person to work with. 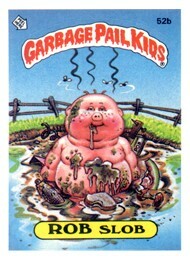 Still buying your GPK art! Comments: WOW! Not only did I receive well packed hard to find much needed cards in excellent condition, but they came extremely quick considering it was from Finland. AND, if that wasn't enough, he threw in TONS of extras including some AWESOME foreign cards I didn't have and some COOL Finnish postcards/brochures! No PM's - Send an email to ORawls@hotmail.com instead! Comments: Helped me a ton by finding/selling me hard-to-find foreign singles's. Great price, fast shipping and even threw in a free wrapper and title card! Thanks again!!! Comments:Purchased a few extra sketches,A++ Thanks man. Comments: Got the hookup for a couple of Foreign Sticky Rick cards. Thanks a million my friend! Comments: Positive as always, Henry always has great cards at fair prices. He's a huge help. Comments: GPKtilldeath hooked me up with a super rage 4th series Sgorbions card of Fryin Brian. I had no idea it even existed. Great guy and great seller and I'm assuming a great trader as well. Thanks sooooo much!!!! Its an excellent addition to my collection. Comments: I hate to write this because we have never had problems so far. I had to leave for a while my city, so I shipped a package to GPKtilldeath without receiving his payment trusting his word on August 14th. How is it ended? I am still waiting his payment. I am positive he will pay, and I will try to update this post if I will ever have any news. Comments: I have done many deals with Henry over the last year or so. I have bought many high dollar items and sold several items. Never had a problem. Fast shipping, good communication, great packaging and the items always were exactly as described. Comments: I have bought and sold a few times, and always a pleasant transaction. Will be glad to do more trades in the future!